Video2Webcam 3.5.1.2 - Download Win Apps. Video2webcam enables you to show videos as virtual webcam during video chat..
Video2webcam enables you to show videos as virtual webcam during video chat whether you own a real webcam or not. You could either share your home-made video clips with your friends while chatting on line or make fun of them by pretending to be somebody else. With it, you can play a variety of videos on messengers and switch between real and virtual webcams freely. 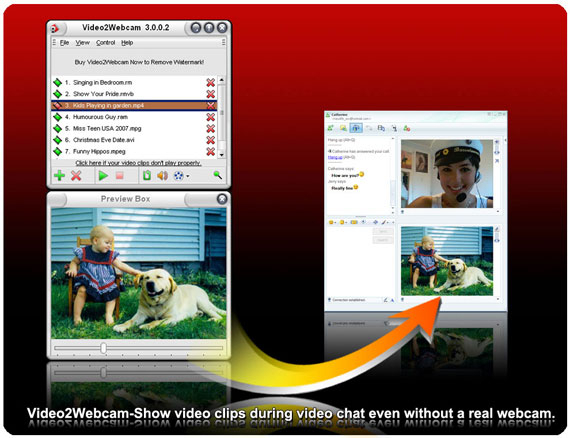 It works on all webcam programs and supports all kinds of media file formats.